This article was written by Melanie Buck and published by the Sunlight Foundation on December 1, 2010. In Ms. Bailor’s case, Rep. Julia Carson introduced legislationin 1997 to give her compensation. Private laws have been used to protect private property, grant waivers for certain federal or legal requirements, provide personal compensation for transgressions by the government, and address refugee or transportation concerns. 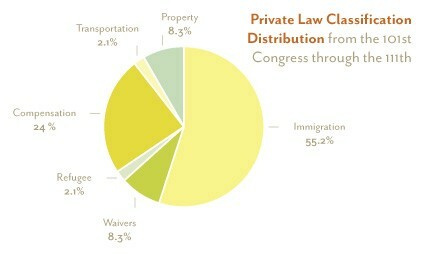 The majority of bills concern immigration cases. In theory, each private bill represents a petitioner who has exhausted all other options for redress. 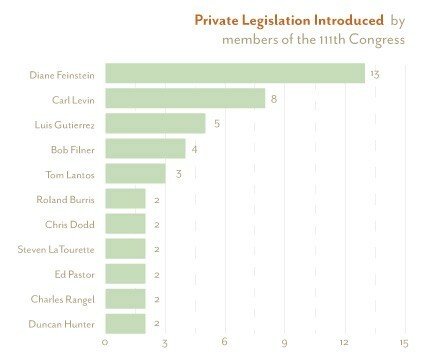 Despite this decreasing frequency of enactment, Members still introduce a significant number of private laws each Congress. 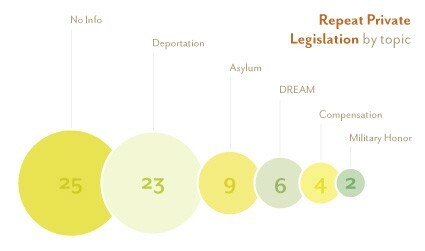 Many bills are reintroduced over many Congresses, although few are ultimately acted upon. For example, the legislation regarding Ms. Bailor was introduced in every Congress from the 105th through the 110th. A private bill for the relief of Kadiatou Diallo — the mother of Amadou Diallo — and her family has been introduced in each Congress since the 107th. A private bill for Ibrahim Parlak, a Kurdish immigrant serving jail time in America, has been introduced in each Congress since the 109th. 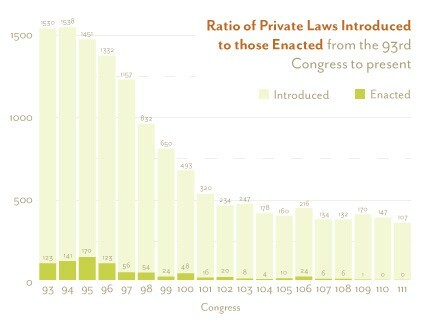 Of the 107 private bills introduced in the 111th Congress, 63 were introduced in previous Congresses. The Decline of Private Laws was originally published in Demand Progress on Medium, where people are continuing the conversation by highlighting and responding to this story.